IN THE days when Norsemen pillaged their way around the monasteries and villages of Europe, Norwegian shipwrights were at the forefront of naval architecture. They still are. Norway is an important centre of marine innovation and several foreign companies have operations there, too. One such is the marine division of Rolls-Royce, a British firm, which is collaborating with Farstad, a shipping company based in Alesund, and STX OSV, a shipbuilder. The result of their efforts is Far Solitaire (pictured above), the first of a new class of vessels which bristle with novel technology that promises to make shipping safer, cleaner and cheaper. 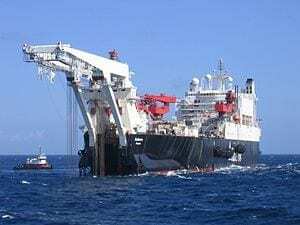 Far Solitaire has been designed as a platform-supply ship for the North Sea’s oil and gas industry. This means she is not a large vessel. She is 91 metres long (one-third of the length of a typical container ship), has a deadweight of 5,700 tonnes and cost about $70m. But some of the innovations she uses should be applicable to vessels of all sizes. At the moment she is being fitted out by STX OSV at its Langsten shipyard on Tomrefjord. In October she will be delivered to Farstad, who will use her to supply rigs in the region’s notoriously heavy seas. Crucially, she has to be able to hold her position while transferring cargoes that include various noxious materials which are employed in drilling or pumped into wells to improve the process of extraction. These have to be delivered to and removed from the platforms. Such transfers are potentially hazardous for the people involved and for the environment. One of Far Solitaire’s most important innovations is her wave-piercing hull. Below the waterline her bow has the bulbous drag-reducing nose that has become a familiar feature of modern ships. Above it, however, things are all new. Where a standard ship’s bow would have a flat foredeck, Far Solitaire’s flows up and over the vessel. This means that instead of riding the waves, as most ships do, she can penetrate them. That is a crucial change. When a ship rides the waves her engines slow down and then surge as her hull rises and falls. By piercing the swell, Far Solitaire will be able to maintain her engines at a constant speed. This will cut fuel consumption, reduce wear and tear, and make life for the crew safer and more comfortable.